The sky grows dark, the earth trembles… the Mayan Death Robots have come! It’s not the end of the world, it’s a beginning of a new one. A world in which the Mayan Death Robots blow great big holes in the lush landscape of Latin America in the name of alien televisual entertainment. As the Belgian soothsayers at Sileni Studios predicted, the full force of the killer alien robots has been unleashed today, with Mayan Death Robots available now for PC via Steam priced 14.99 € plus a 10% discount for the first week. 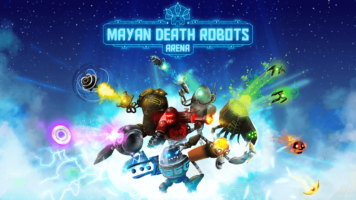 It’s with great joy that independent developer Sileni Studios announces the addition of single player versus AI battles to Mayan Death Robots, joining the local PvP multiplayer already in the game. But everything has its price, and this time it’s online play which will no longer be in the game at launch. Expectant fans shouldn’t be downhearted – now they’ll be able to hone their alien robot battle skills during those quiet moments alone before they kick their friends’ asses into next week.